After six years, Planetside 2 is getting a fourth faction. The massive-scale FPS celebrated its sixth anniversary yesterday and, during a livestream, revealed the game’s first new faction since launch. Nanite Systems Operatives don’t function like soldiers, however, as they’re robotic mercenaries who fight on behalf of other other factions. These playable neutral mercs will join whichever faction in the zone has the lowest population. If you switch to a different zone, you’ll be reassigned. The Nanite Systems Operatives will only be available to members, but the developers believe that their inclusion will benefit Planetside 2 as a whole, reducing queue times and balancing wars and individual fights. It’s an unusual addition, though the original Planetside did something similar, with developers occasionally putting players in a fourth faction that had more health and access to all the weapons. All the other factions would then team up and try to destroy them. 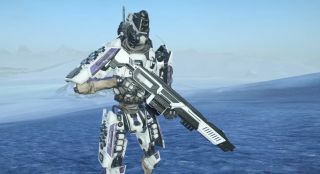 Planetside 2 is all about huge battles and armies colliding, which I imagine is tricky to maintain over the course of six years, as players drift off to new things, so anything that keeps fights balanced enough to be interesting sounds like a good thing. Something that's worth noting is that Nanite Systems Operatives are lone wolves. They can be in outfits (Planetside 2's clans) but there's no guarantee they'll be playing with the fellow members of the outfit; it all depends on what assignment they get. It has changed a lot since 2012, not least because of the introduction of base building, but here's what Rich McCormick thought of it way back then in his Planetside 2 review. For those with the machine to handle it, Planetside 2 is never anything less than staggering. On your own, it's a spectacle. Stand far enough back and you can almost take it all in, but there's just too much there to focus on. With teammates, the picture comes into glorious focus. Dogfights in the frigid air, gunfights among the trees of a dense jungle, tanks duelling across the plains of a red desert: like stars in the night sky, Planetside 2 is beautiful. Nanite Systems Operatives are available on the test server now.